Greenleaf Book Group Press, 9781626346000, 48pp. Set in the heart of the African Savanna, Love Big follows moody Baboon as he discovers another powerful secret. The once lush, thriving, African savanna has turned dry and desolate. Hungry, miserable, and mean animals seek only their own interests. Baboon watches as, one by one, Rhinoceros destroys Termite's castle in his race to find food, Hare chooses not to share food with her family, and Lion steals food from his pride. But after Baboon sees Rhinoceros give Hare his snack-on-a-stick, everything changes Baboon realizes that a transformative power exists between the animals and the star-dust that surrounds them once they share smiles and truly believe in themselves and each other. When Baboon tries out this secret by helping Lion, they share a smile, and CATCH-M, The Magical, Mystical, Miraculous Star-dust that surrounds them, whooshes into their lives to wham ignite the courage in their chests too. Read on to see if Baboon can save the savanna with this new secret and a very stinky, unlikely hero . 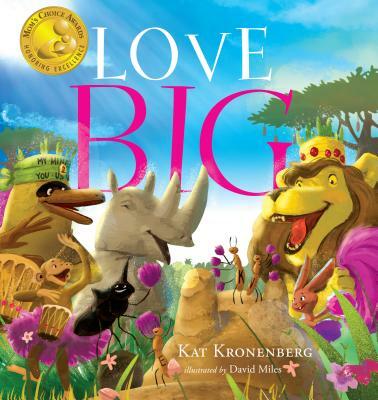 . .
​Love Big takes place generations after the magic in Kat Kronenberg's best-selling book, Dream Big. This new book's beautiful message makes it a wonderful gift for those who want to build a loving WE community--from home to school, neighborhoods, church, or travel. If people can begin to encourage one another to pursue their passions--with kindness, sharing, listening, and care--we can overcome anything and achieve extraordinary dreams together. Kat Kronenberg is a born-and-raised Texan with a Big Dream--that Two-Leggers, people, all around the world catch CATCH-M too, watch their wildest dreams come true, and live out the motto: ''Believe YOU CAN! Smile. Be you and jump for joy as you do!'' Kat lives in Austin with her husband and is the proud parent of two amazing boys, two beautiful adopted nieces, two extraordinary grandchildren, and three four-legged friends.